Society Rock saw off a top-class field at Haydock to gain a second top-grade success when winning the Group 1 Haydock Park Sprint for James Fanshawe and Kieren Fallon. 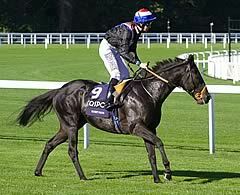 The five-year-old had won the Diamond Jubilee Stakes at Royal Ascot in 2011 but had been out of luck subsequently but he asserted his authority at Haydock when scoring by three-quarters of a length. Hitting the front a furlong out, the 10-1 chance ran on well to hold the challenge of Irish raider Gordon Lord Byron by three-quarters of a length, with the well-backed Bated Breath third. Aussie mare Ortensia raced much handier than when winning the Nunthorpe, but could never get in a serious blow. Society Rock, who was bred by San Gabrial Investments, had finished third in testing conditions in the July Cup at Newmarket on his previous run and Fanshawe was delighted to get back on the winning trail. Gordon Lord Byron could return to handicap company after the best run of his career to date. "It was a great run and he's a smashing horse," Tom Hogan, Gordon Lord Byron's trainer, said. "William Buick told me after [he won at] York that he needed a stiff six and that he would win a Group One over a stiff six or seven. He said Haydock might be a bit sharp for him and his reading was probably 100% right." 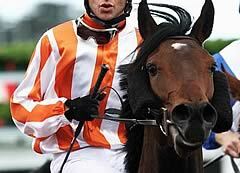 The Co Tipperary trainer added: "There are lots of options for him now. 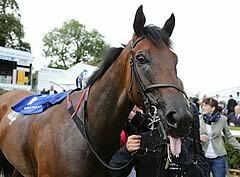 He is in the Ayr Gold Cup in a fortnight's time and he will not have to carry a penalty for that." Gordon Lord Byron is 10-1 favourite (from 14-1) for the Ayr sprint with Coral. Ortensia suffered an overreach during the six-furlong feature, resulting in a one-inch cut in her leg, as she finished well beaten behind Society Rock. Trainer Paul Messara reports the damage to be not too serious and his stable star is expected to go into quarantine shortly in preparation for her long trip across the globe. "She's a bit tender. She sustained a pretty good splicing at the back of her fetlock in the race," said Messara. "I'm not sure exactly at what stage of the race she did it, but she got a good one-inch cut right at the back of the fetlock right over the sesamoid, so it would have been quite painful for her to run on it. "She did it early in the race and has done it a few times because she actually cut through the bandage. We had both fetlocks bandaged and she still managed to put an inch splice in it. "We're not sure if she did it jumping out of the stalls in the first few strides or at another stage. It certainly is sore enough and a big enough cut for her not to stretch out as we would have expected her to over the final two furlongs. "Luckily I don't think it's going to be a long-term thing. Hopefully after a couple of weeks to heal up, the bruising will go away and she will be OK.
"She's still in Newmarket at the moment, but she will probably go into quarantine this week and get home. "It was just disappointing we couldn't put the icing on the cake on Saturday, but unfortunately that's racing. She certainly had a fair excuse after she pulled up and we got a chance to see what the full story was."